When looking for the best way to suit up for you next ride, you need the right clothing and gear. With our selection of Polaris ATV apparel and gear, find everything you need all in one convenient place. When riding an all-terrain vehicle, there are certain elements that are simply a must have for the ride. We are pleased to offer a wide selection of these items to help you make the most of every ride. 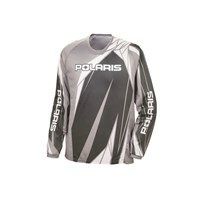 We offer one of the most diverse inventories of Polaris ATV apparel for your needs. Our selection features the best in manufacturing to ensure total satisfaction with every purchase. Made with a focus on durable materials and the highest of manufacturing standards, every option is sure to please and meet your expectations. We offer a diverse selection of must-have items in our collection of Polaris ATV apparel to accommodate a range of needs. For example, bags and luggage can be an important part of your ride. The right luggage solution can store your items in a safe, secure manner which is always imperative. When looking for protective gear, we offer a range of options such as helmets, visors replacements, lenses, and more. From tees and hats to sweatshirts and jackets, our selection of Polaris ATV apparel has it all for both riding and casual wear clothing. Whether looking for something to ride in or something to show your brand loyalty in your downtime, find it right here. We offer options for men, women, youths, and even onesies for babies! With boots and socks and headwear, you can outfit yourself in head to toe Polaris gear. Regardless of what you are looking for today in terms of clothing or gear, we have you covered with our selection of high-quality solutions. Find something new for your next ride or just hanging out right here with our inventory! Please feel free to contact us with any questions about our selections. We are always happy to help.